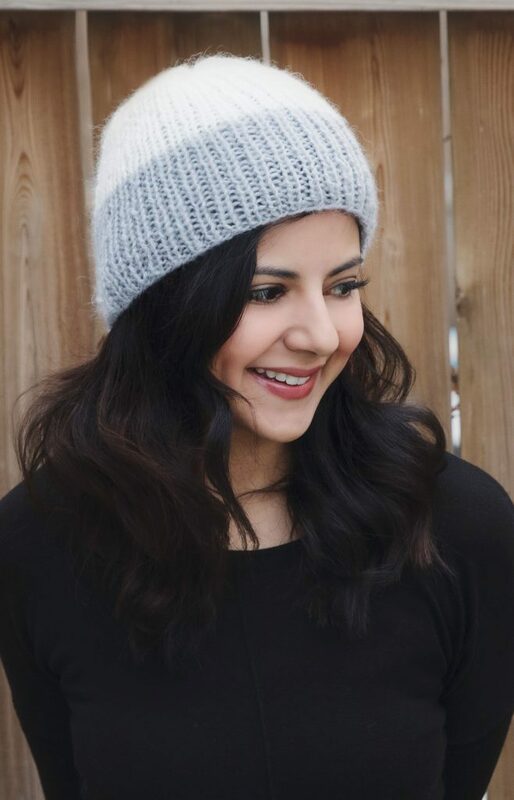 Nothing says January like a warm cable knit hat! I designed this toque to be extra toasty since we are heading into our coldest months of the year. The yarn that I selected is my favourite bulky yarn: Knit Picks Biggo. Its extra thick, and extra soft – the perfect combination! I have written out and posted the free pattern for this cozy hat below on this page. 16″ US11/8 mm circular knitting needles. US 11/8 mm double pointed needles. One Hank (110 yards) Knit Picks Biggo Yarn in Bare. 3.25 stitches = 1 Inch in stockinette stitch. Note: Adult head circumference = 22 inches. C6B: Cable 6 Back (slip 3 stitches onto your cable stitch holder to the back of your work, knit the next three stitches, then knit the three stitches off of the cable needle). This hat is worked in the round. Using circular needles, cast on 60 Stitches. Place the stitch marker to mark the beginning of the round and join being careful not to twist your work. Rounds 1-6: *K1, P1; repeat from * to end of round to make 1X1 ribbing. Round 7-12: *K6, P4; repeat from * to end of round. Round 13: *C6B, P4; repeat from * to end of round. Round 14: *K6, P4; repeat from * to end of round. Repeat rounds 7-14 two more times. Round 1: *K6, P2Tog, P2Tog; repeat from * to end of round (48 stitches remain). Round 2: *K6, P2; repeat from * to end of round (48 stitches remain). Round 3: *K6, P2Tog; repeat from * to end of round (42 stitches remain). Round 4: *K6, P1; repeat from * to end of round (42 stitches remain). Round 5: *K2Tog, K2, K2Tog, P1; repeat from * to end of round (30 stitches remain). Round 6: *K4, P1; repeat from * to end of round (30 stitches remain). Cut yarn (leave a long tail) and pull through yarn needle. Thread through the remaining stitches and pull tight. Secure and weave in ends. I saw this pattern this morning on Instagram and here it is. I love the pattern and I’m excited to get it started. So glad to hear! I hope you enjoy it! Beautiful hat! I have not mastered double pointed needles. Can i just use a shorter circular needle? TX! Cute! When I knit cables the last stitch in each cable section is always stretched out…any tips on how to avoid this?